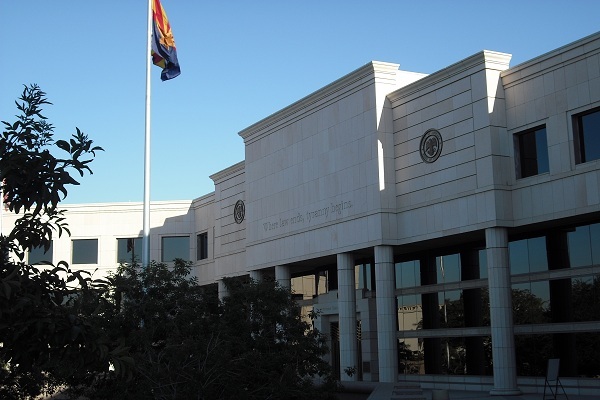 Applications are being accepted for two new positions on the Arizona Supreme Court. The Commission on Appellate Court Appointments will review applications, interview selected applicants, and recommend at least three nominees for each position to Governor Doug Ducey. A copy of the application form can be downloaded at the Judicial Department web site. Applications may be also obtained from the Administrative Office of the Courts, Human Resources Department, 1501 W. Washington, Suite 221, Phoenix, by calling (602) 452-3311, by sending an electronic mail request to jnc@courts.az.gov. Applicants must be at least 30 years of age, of good moral character, and, for the past 10 years, admitted to the practice of law in and residents of Arizona. The original completed application, one single-sided copy and 16 double-sided copies must be returned to the Administrative Office of the Courts, Human Resources Department, 1501 W. Washington, Suite 221, Phoenix, AZ, 85007, by 3:00 p.m. on August 8, 2016. The Commission may, at its discretion, use the applications filed for these vacancies to nominate candidates for any additional vaca­ncies known to the Commission before the screening meeting for these vacancies is held. As of January 1, 2017, the new justices will be paid $157,325 annually. Two new Arizona Justices will be appointed, following a new law signed by Gov. Doug Ducey. Applications are due August 8, 2016. 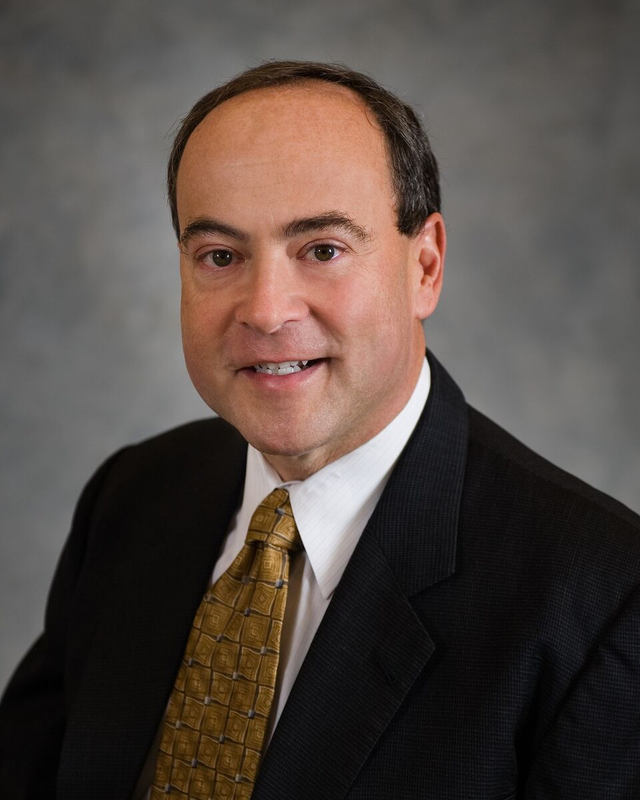 This month, attorney Clint Bolick was selected as a new Arizona Supreme Court Justice by Gov. Doug Ducey. It cannot be easy to select a new state supreme court justice. So much is involved in the job that a panel must weigh a broad array of talents and experiences. And at the end of the day, the old adage applies: You can’t please everybody. You can read news stories about his appointment by Gov. Doug Ducey here, here, and here. Whatever your view of his appointment, I was pleased to watch Clint Bolick’s interview as he sat before the appointments panel (and I urge you to watch it here). Sitting in the hot seat, Clint did extremely well. He did not appear there as a man who lacks the skill and experience for the job. Nor did he overcompensate by appearing prideful about his litigation record. Instead, he was—and is—soft-spoken and self-effacing. And that has been my experience of him as a colleague and writer. If there is an entry for “disarming interview” in the dictionary, he would occupy the spot. Of course, none of that means you will necessarily be pleased (or disappointed) in his subsequent opinions. His judicial record will now roll out over a course of years. Until then, I congratulate Justice Bolick and wish him the best. 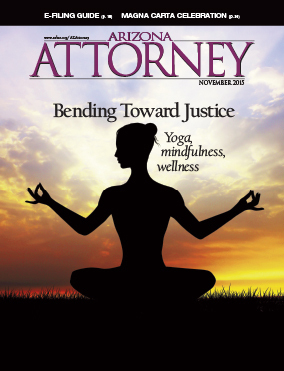 “Bending Toward Justice” was the headline for our November cover story of Arizona Attorney Magazine. We thought it was an ideal combination of lawyers practicing yoga and one of the most evocative quotes of the civil rights era. In the meantime, I’ve noted before how yoga has made legal news this fall. So maybe I was just primed for the topic when I opened Google this week to the animated image of a man bending into a yoga pose. More detail on this remarkable man is here. And our quote about the arc of justice? If you said it comes from Rev. Martin Luther King, Jr., you would be correct. He spoke the moving words in August 1967 when he addressed the Southern Christian Fellowship Conference. I hope in this, the stirring month of December, you exercise your power and skill in the effort to bend toward justice. A new portrait of Hon. Michael D. Ryan, dedicated on April 25, 2014. 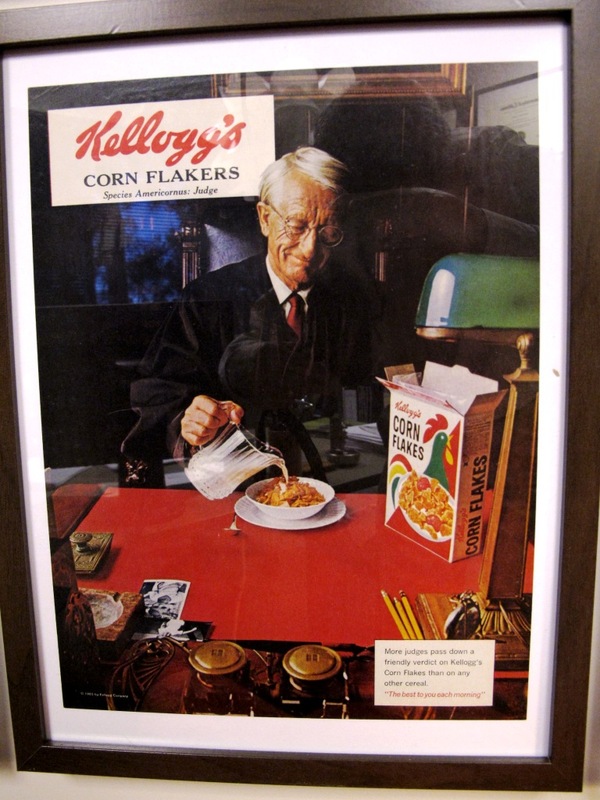 On Friday, April 25, a terrific lawyer and judge was honored with the dedication of an oil painting depicting him. The jurist recognized was Justice Michael D. Ryan. You can read Justice Ryan’s obituary here. I wrote about him in Arizona Attorney Magazine here. Today, I share a great story about the event written by the staff of the Superior Court for Maricopa County. I was very sorry to have to miss the event, but I am pleased that Mike Ryan’s friendly visage has become a permanent part of the courthouse. 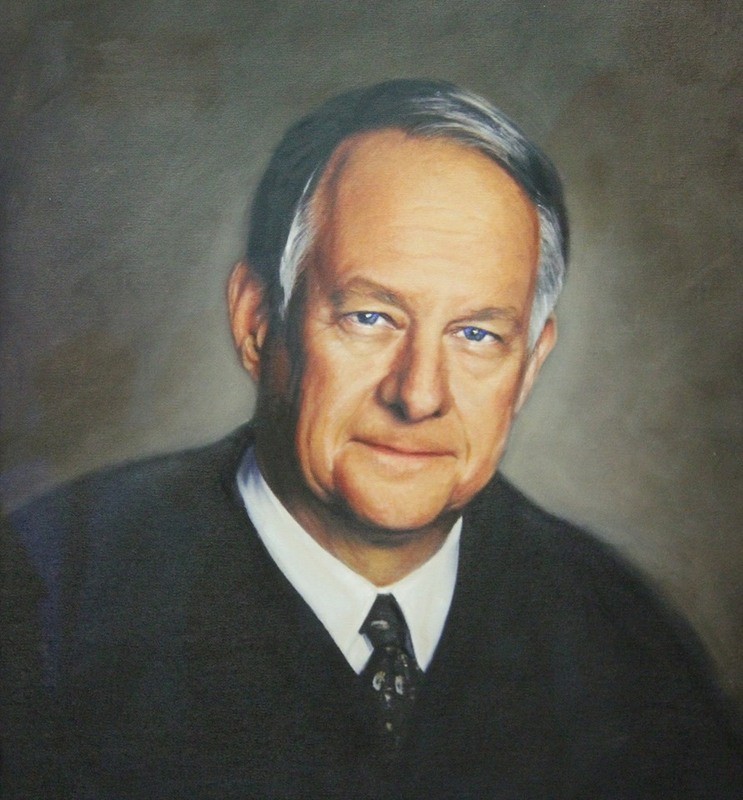 On April 25, Superior Court celebrated the distinguished career of The Honorable Michael D. Ryan with a portrait dedication ceremony. Justices, judges, former judges, court staff, friends and family attended the ceremony at the Old Courthouse in Phoenix to pay their respect to a brilliant legal mind who dedicated 24 years to working in the Judiciary. Justice Ryan served as a Superior Court Judge, a Court of Appeals Judge and an Arizona Supreme Court Justice. During the ceremony, Justice Ryan’s wife, Karen, and son, Kevin, unveiled the portrait and Presiding Judge Norman Davis, Commissioner R. Jeffrey Woodburn and Retired Judge Ron Reinstein spoke on behalf of their friend and former colleague. Justice Ryan was known as a fair and thoughtful jurist who managed his courtroom in a firm but respectful manner. He was respected by all who appeared before him as well as those who served beside him. As a Superior Court Judge, he presided over high profile cases such as AzScam, the Phoenix Suns drug case and the criminal trial of Governor Evan Mecham. Prior to joining the Bench, he served as a Maricopa County prosecutor. Justice Ryan received his Juris Doctorate from Arizona State University. He also was the recipient of two Purple Hearts and the Bronze Star for his service as a United States Marine Corps platoon commander in the Vietnam War. If any profession is to tease out and examine the necessary concepts that underlie it, a fine way to do that is to observe the profession under stress. 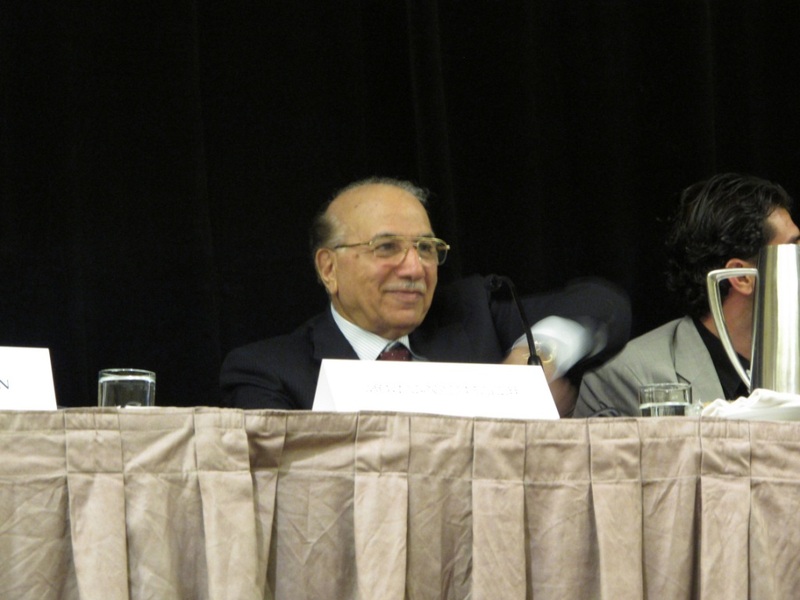 For that reason alone, the remarks of the Iraqi Chief Justice were a superlative end to Convention. I wrote before about the visit to Arizona of Chief Justice Medhat Al-Mahmoud. If anything, his insights surpassed attendees’ expectations. He was introduced by ASU Law School Dean Doug Sylvester, who reminded us that Iraq and its environs are not merely the cradle of civilization; they are the cradle of our legal system. And then the Chief Justice, his Farsi translated by a dedicated assistant, explained what it was like to have that cradle overturned—and smashed to bits. When the coalition powers dissolved the Iraqi security agencies, he said, those powers aimed to loosen the grip the agencies had on the people. To an extent, they succeeded. But the rule of law was eliminated, as well. One of the most concrete examples of that elimination was the destruction of the Ministry of Justice by fire. This realization occurred, of course, when the nation was at war and risk was everywhere. Given that, a courageous focus on the rule of law defies belief. That will to rebuild came in the face of terrible personal sacrifice. The Chief Justice noted that in the process of rebuilding the judiciary, 49 judges were killed, and 132 other employees—prosecutors, public lawyers and others—were assassinated. On June 12, 2003, the Chief Justice was named the Minister of Justice. His charge was to reestablish the judicial institutions. That restoration is demonstrated by the numbers: In November 2003, he said, there were 575 judges in Iraq. In 2012, there are 1,328. And his first decision in the rebuilding? Bring back to the court women judges. Their numbers have jumped from 7 in 2003 to 76 today. What drives an individual to face down danger in order to adhere to an ideal? For the Chief Justice, it comes down to each judge. ASU Law School’s Daniel Rothenberg then spoke of the Chief Justice’s willingness to share credit with others. Yes, Rothenberg said, we should admire the “extraordinary quality of patriotism of all Iraqis who put their life on the line” in the pursuit of justice. But, he added, we also must grasp how important the Chief Justice was to the rebuilding of justice. Also speaking at the session was Tom Monaghan, a former United States Attorney for the District of Nebraska. His focus that afternoon was on his work from 2003 to 2005 in Kosovo as the U.N.-appointed director of justice. For those lawyers who are interested in assisting in rule of law initiatives around the globe, panelists suggested they look here. This past weekend, I read a moving op-ed piece in the New York Times. It was in regard to the brutal slaying of a Chinese American man in 1982. Significantly, his death and the legal events that followed so angered the Asian American community that it demanded substantive changes. 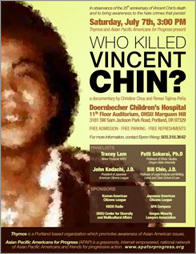 I previously wrote about the Vincent Chin case here and here. It was brought to my attention by great Arizona lawyers, who featured a documentary about the case at the 2011 Minority Bar Convention. 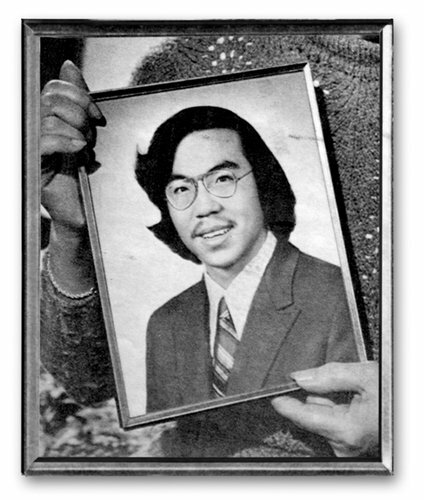 “On June 23, 1982, in Detroit, a young man named Vincent Chin died. Four nights earlier, he had been enjoying his bachelor party with friends at a local bar when they were accosted by two white men, who blamed them for the success of Japan’s auto industry. ‘It’s because of you we’re out of work,’ they were said to have shouted, adding a word that can’t be printed here. The men bludgeoned Mr. Chin, 27, with a baseball bat until his head cracked open. So congratulations to my dean for writing on a matter of great importance—and in the New York Times, no less. Well done. Later this week, I will share two remaining posts arising from the State Bar Convention last week. Both were phenomenal speaker opportunities, the kind that stay with you long after the applause fades. Yes, you read that right: food breaks. We all recognize that any human endeavor is susceptible to error. And through expectation and experience, we know that judging faces the same challenges. Hell, the very existence of appellate courts signals our understanding that a black robe is not paired with infallibility. 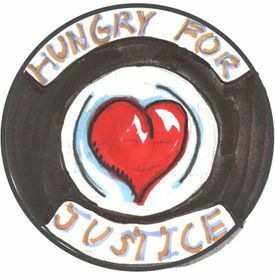 But the possibility that justice rendered soon after lunch surpasses the justice rendered when the judge is hungry? That’s just a tad depressing, don’t you think? My first impression was that there were enough oddities in the facts that the data could be distinguished from what we encounter in American courtrooms. But the researchers anticipated that argument, and worked hard to address claims that their findings were not generalizable. The short of it is that litigants may fare better if their judge has recently had some good fare. Well, I’m off to lunch. Have a great weekend.